α-Bromination of the side chain of aromatic ketones using NBS in the presence of p-toluenesulfonic acid (p-TsOH) in acetonitrile is very common. However, regioselective bromination of bis and tris(ω -bromoacetophenones) with NBS in the presence of p-TsOH in acetonitrile under microwave irradiation is quite novel. The bis- and tris(ω -bromoacetophenones) are used in synthesis of bis and tris(heterocycles). bis(heterocycles) have received a great deal of attention, because many biologically active natural and synthetic products have molecular symmetry. The use of the pressurized microwave irradiation is very advantageous to many syntheses and provide a large rate enhancement. Bis and tris(ω -bromoacetophenones) were obtained as single monobrominated derivatives in a shorter time than the conventional conditions. The results clearly demonstrate the better reactivity and selectivity of NBS/p-TsOH/CH3CN as a brominating mixture under microwave conditions. The reaction of bis and tris(ω-bromoacetophenone) with 2-aminopyridine and 2-aminopyrimidine proceeded smoothly in a mixture of anhydrous ethanol and DMF under reflux or using 300 W/105°C/ 20 min microwave irradiation conditions to afford the corresponding bis(imidazo[1,2-a]pyridine), bis(imidazo[1,2-a]pyrimidine) and tris(imidazo[1,2-a]pyridine) derivatives in moderate to excellent yields. The carbonyl analogue of the targeted bis(imidazopyridines) could be synthesized by the reaction of N,N-dimethyl-N'-(pyridin-2-yl)formimidamide with bis(ω-bromoacetophenone) in refluxing ethanol. The structures of the newly synthesized compounds were confirmed by their spectral data as well as their elemental analyses. 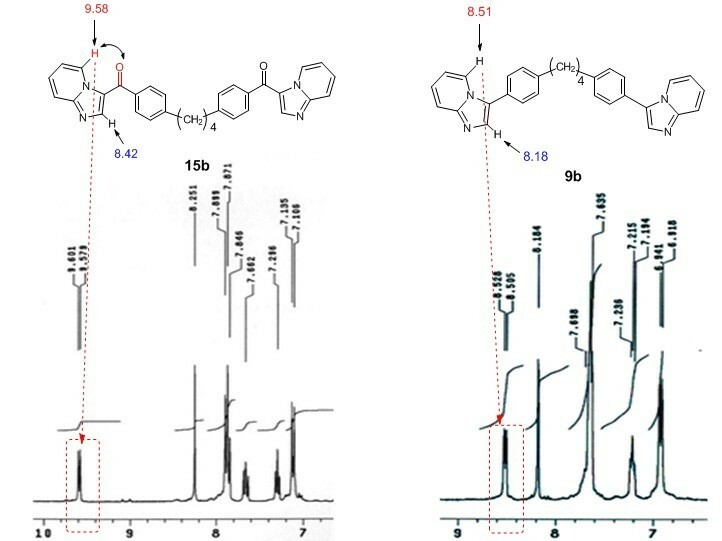 In conclusion, selective α-bromination of bis- and tris(acetophenones) has been accomplished efficiently utilizing NBS/p-TsOH/CH3CN under microwave irradiation. In addition, a facile synthesis of novel series of bis- and tris(imidazopyridine) and bis(imidazopyrimidine) derivatives. In recent decades, imidazo[1,2-a]pyridine and the related imidazo[1,2-a]pyrimidines derivatives have received a significant attention in pharmaceutical industry owing to their interesting biological activities . They displayed a broad range of therapeutic activities, including antibacterial , antifungal , antiviral [4–6], and inhibitors of p38MAP kinase . They have also been used as inotropic and β-blocking agents , benzodiazepine receptor agonists , and anesthetic activity . Drug formulations containing imidazo[1,2-a]pyridines are currently available on the market, for example alpidem (anxiolytic), zolpidem (hypnotic), and zolimidine (antiulcer). On the other hand, bis(heterocycles) have received a great deal of attention, not only as model compounds for main chain polymers but also because many biologically active natural and synthetic products have molecular symmetry [11–22]. Moreover, the synthesis of the imidazo[1,2-a]pyridine and imidazo[1,2-a]pyrimidine ring systems has been widely investigated [23–31]. One of the most common strategies uses 2-aminopyridine or 2-aminopyrimidine, and α-halocarbonyl compound as starting materials. However, up to the best of our knowledge no synthesis of bis(imidazo[1,2-a]pyridine) and bis(imidazo[1,2-a]pyrimidine) ring systems were found in the literature, so far even under conventional conditions. Nowadays, the use of the pressurized microwave irradiation can be very advantageous to many chemistries where the solvent can be heated up to temperatures that are 2–4 times their respective boiling points and thus providing large rate enhancement [32–34]. In addition, keeping the atmosphere away from moisture that may affect the moisture sensitive reagents decreases the possibility of formation of the undesired byproducts. As a part of systematic interest in the synthesis of fused heterocyclic systems having potential unique properties [35–38], and in continuation to our interest in the synthetic utility of bis(ω-bromoacetophenones) as building blocks for novel bis(fused-heterocycles) , the aim of the present work is to define versatile route to synthesize bis- and tris(fused-heterocycles), in an efficient one step synthesis under microwave irradiation. Also, α-bromination of a structurally different acetophenones using NBS and toluenesulfonic acid as an inexpensive catalyst in acetonitrile under microwave irradiation was improved. α-Bromination of the side chain of aromatic ketones has attracted attention because the resulting bromoketones are important synthons used for the variety of biologically active heterocyclic compounds. Recently, we reported the synthesis of bis(ω -bromoacetophenones) using the reaction of their corresponding bis(acetophenones) with NBS in the presence of p-toluenesulfonic acid (p-TsOH) in acetonitrile under conventional heating. However the long reaction time was one of the disadvantages at that time . ω -Bromoacetophenones 3a-c and 4a-c were obtained as single monobrominated derivatives in a shorter time than the conventional conditions (Scheme 1, Table 1). The results clearly demonstrate the better reactivity and selectivity of NBS/p-TsOH/CH3CN as a brominating mixture under microwave conditions, in fact dibromination or aromatic ring bromination were not observed. Synthesis of bis( ω -bromoacetophenones) 3a-c and 4a-c. In the same manner, the structurally interesting tripodal ω-bromoacetophenone derivative 6 could be obtained by the reaction of the potassium salt of 4-hydroxyacetophenone (1b) with the appropriate 1,3,5-tris(bromomethyl)benzene 5, in boiling DMF followed by NBS bromination under microwave irradiation (Scheme 2). The structure of the tris(ω-bromoacetophenone) derivative 6 was confirmed by its elemental analyses and spectral data. For example, the 1H NMR spectra of 6 displayed a singlet signal at δ 4.40 due to CH2 protons, a singlet signal at 5.19 due to CH2O protons, two doublets at δ 7.01 and 7.93 (J = 9.0 Hz) due to aromatic protons, in addition to core aromatic ring protons singlet at δ 7.49. Synthesis of tris( ω -bromoacetophenones) 6. Several routes for imidazo[1,2-a]pyridine and imidazo[1,2-a]pyrmidine skeletons have been developed [23–31], but, the access by the reported methods to those functionalized fused systems, is usually difficult. In this context, 2-aminoazines were chosen as bis(nucleophilic) heterocyclic reagents. These heterocyclic amines namely, 2-aminopyridine (7a) and 2-aminopyrimidine (7b) have readily accessible two nucleophilic centers for the preparation of bis(imidazo[1,2-a]pyridine) and bis(imidazo[1,2-a]pyrimidine) derivatives, respectively. The reaction of bis(ω-bromoacetophenone) 3a-c and 4b,c with 2-aminopyridine and 2-aminopyrimidine (7a,b) proceeded smoothly in a mixture of anhydrous ethanol and DMF under reflux or using 300 W/105°C/ 20 min microwave irradiation conditions to afford the corresponding bis(imidazo[1,2-a]pyridine) and bis(imidazo[1,2-a]pyrimidine) derivatives 8a-e and 9a-d in good to excellent yields (Scheme 3, Table 2). Synthesis of bis(imidazo[1,2- a ]pyridine) and bis(imidazo[1,2- a ]pyrimidine) derivatives 8a-e and 9a-d. The structure of the products 8a - e and 9a - d were confirmed by their spectral data as well as their elemental analyses. For example, the disappearance of bands attributed C = O stretching frequency in the ir spectra is a good evidence for the structure given to those compounds. The 1H NMR spectra of compounds 8a-e and 9a-d showed a characteristic singlet signal resonance around δ 8.50 due to (=C-H) of the imidazole ring (Additional file 1). In addition, the pyridine or pyrimidine ring protons were seen at the expected chemical shifts and integral values. In the same manner when the tris(ω-bromoacetophenone) 5 was treated with 2-aminopyridine (7a), under the same microwave conditions, it afforded the tripodal imidazo[1,2-a]pyridine 10 (Scheme 4), however the yield of the product was moderate after 30 min. of irradiation. Synthesis of tris(imidazo[1,2- a ]pyridine) 10. The carbonyl analogue of the targeted bis(imidazopyridines) 14a,b and 15a,b could be synthesized by the reaction of N,N-dimethyl-N'-(pyridin-2-yl)formimidamide 12 with bis(ω-bromoacetophenone) 3a,c and 4c,d in refluxing ethanol (Scheme 5, Table 3). Synthesis of the carbonyl analogue of the targeted bis(imidazoazines). The IR spectrum of compound 15a (taken as an example) in KBr showed, in addition to the expected peaks of the imidazopyridines 15a, a peak at wave numbers near 1660 cm-1 corresponding to the C = O group. The presence C = O band was an evidence for the pathway of the cyclocondensation of the appropriate bis(ω-bromoacetophenone) derivatives with the N,N-dimethyl-N'-(pyridin-2-yl)formimidamide 12 as shown in Scheme 5. Moreover, the 1H NMR spectra of the p-isomers of imidazoazines 15 showed that C5-H signal of 15b is downfield of the corresponding proton for 9b, respectively which provide an additional support for the suggestion that the carbonyl group anisotropy impacts the position of the aforementioned NMR signals as shown in Figure 1. Aromatic region of the 1 H NMR spectra of the p -isomers of 15b and 9b. It was expected that the bis(imidazopyridine) 15b could be obtained via the alternative one pot three component reaction of the bis(ω-bromoacetophenone) derivative 4c (taken as an example), 2-aminopyridine (7a), and dimethylformamide dimethylacetal (11) under solvent free conditions. However, the reaction afforded a product identical in all respects (mp, mixed mp, and spectra) with the analogue imidazopyridine 9b rather than 15b as shown in Scheme 5. In conclusion, selective α-bromination of bis- and tris(acetophenones) has been accomplished efficiently utilizing NBS/p-TsOH/CH3CN under microwave irradiation. In addition, a facile synthesis of novel series of bis- and tris(imidazopyridine) and bis(imidazopyrimidine) derivatives via the reaction of bis(ω-bromoacetophenone) derivatives with the appropriate aminoazine or their formamidine derivatives was achieved. The synthesized bis-, and tris(fused-heterocycles) offer an advantage of their easy synthesis on a large scale quantities in a simple procedure from inexpensive starting materials and it is expected that they would be useful compounds with potentially high pharmacological and biological activities. All melting points were measured on a Gallenkamp melting point apparatus. The infrared spectra were recorded in potassium bromide discs on a Pye Unicam SP 3–300 and Shimadzu FT IR 8101 PC infrared spectrophotometers. The NMR spectra were recorded on a Varian Mercury VXR-300 NMR spectrometer (1H NMR (300 MHz) and 13C NMR (75.46 MHz)) and Bruker-500 NMR spectrometer (1H NMR (500 MHz) and 13C NMR (125.77 MHz)) were run in deuterated chloroform (CDCl3) or dimethyl sulfoxide (DMSO-d 6 ). Chemical shifts were related to that of the solvent. Mass spectra were recorded on a Shimadzu GCMS-QP1000 EX mass spectrometer at 70 eV. Elemental analyses were carried out at the Micro-analytical Centre of Cairo University, Giza, Egypt and recorded on Elementar-Vario EL automatic analyzer. Microwave irradiation was performed using the MARS system of CEM which is a multi-mode platform equipped with a magnetic stirring plate and a rotor that allows the parallel processing of several vessels per batch. We used the HP-500 (teflon (TFA) insert) (vessel volume 80 mL, max pressure 350 psi, max temperature 210°C) in order to get the maximum save operation. 1,ω-bis(4-acetylphenoxy)alkane and tris(acetophenone) derivatives were prepared following the reported procedures [39–41]. The appropriate bis(acetylphenoxy)alkanes or Tris(acetylphenoxy)alkane (l0 mmol) and p-toluenesulphonic acid (p-TsOH) (5.6 g, 20 mmol), in MeCN (50 mL), was slowly added N-bromosuccinimide (NBS) (3.6 g, 20 mmol). After addition of NBS was complete, the reaction mixture was refluxed with stirring for 2–3 h then left to cool to room temperature. The solvent was evaporated in vacuo and the residue was dissolved in CHCl3 (50 mL), washed with water (3 × 20 mL) and dried over MgSO4. After evaporation of the solvent, the resulting solid was recrystallized from benzene to afford the corresponding bis and tris(ω-bromoacetophenone) derivatives 3a-c 4a-c and 6, respectively . The appropriate bis(acetylphenoxy)alkanes or Tris(acetylphenoxy)alkane (10 mmol) and p-TsOH (20 mmol) were mixed in a HP-500 process vial and NBS (10 mmol) was added portionwise with stirring for 5 min. before irradiation. The vial was capped properly and irradiated by microwaves using pressurized conditions at 90°C for 20–30 min. The solvent was evaporated in vacuo and the residue was dissolved in CHCl3 (50 mL), washed with water (3 × 20 mL) and dried over MgSO4. After evaporation of the solvent, the resulting solid was recrystallized from benzene to afford the corresponding bis and tris(ω-bromoacetophenone) derivatives 3a-c, 4a-c and 6, respectively. The physical and spectral data of the newly synthesized tris(ω-bromoacetophenone) 6 are listed below. 6: Yield 63% (thermally) and 67% (under microwave irradiation), mp. 130°C; IR (KBr) νmax/cm-1 1672 (C = O); 1H NMR (DMSO-d 6 ) δ 4.40 (s, 6H), 5.19 (s, 6H), 7.02 (d, 6H, J = 9 Hz), 7.49 (s, 3H), 7.96 (d, 6H, J = 9 Hz). MS m/z 765 (M++6), 763 (M++4), 761 (M++2), 759 (M+). For C33H27Br3O6 Calcd: C, 52.20; H, 3.58. Found: C, 52.22; H, 3.56. A mixture of the appropriate bis(ω-bromoacetophenone) derivatives 3a-c or 4a,b (5 mmol), 2-aminopyridine or 2-aminopyrimidine 7a,b (10 mmol) in absolute EtOH, was heated at refluxing temperature for 5h. The reaction mixture was then left to cool and the resulting solid was collected by filtration, washed thoroughly with ethanol and dried. Recrystallization from DMF afforded the corresponding bis(fused-heterocyclic) derivatives 8a-e and 9a-d, respectively. A mixture of the appropriate bis(ω-bromoacetophenone) or tris(ω-bromoacetophenone) derivatives 3a-c, 4a,b or 6 (5 mmol), 2-aminopyridine or 2-aminopyrimidine 7a,b (10 mmol) in EtOH/DMF(1:1) were mixed in a HP-500 process vial. The vial was capped properly and irradiated by microwaves using pressurized conditions at 105°C for 20–30 min. The reaction mixture was then left to cool and the resulting solid was recrystallized from DMF to afford the corresponding bis(fused-heterocyclic) derivatives 8a-e, 9a-d and 10, respectively. The physical and spectral data of the newly synthesized compounds are listed below. 8a: mp 293–295°C; IR (KBr) νmax/cm-1 1605 (C = N); 1H NMR (DMSO-d 6 ) δ 4.82 (s, 4H), 7.14-7.17 (t, 2H, J = 9 Hz), 7.35-7.37 (t, 2H, J = 9 Hz), 7.43-7.45 (d, 2H, J = 9 Hz), 7.50-7.52 (t, 2H, J = 9 Hz), 7.73-7.75 (d, 2H, J = 9 Hz), 7.81-7.87 (m, 4H, J = 9 Hz), 8.54 (s, 2H), 8.55-8.57 (d, 2H, J = 9 Hz); 13C NMR (DMSO-d 6 ) δ 67.64, 111.69, 112.13, 113.54, 114.06, 115.29, 116.83, 121.40,127.66, 128.21, 131.56, 132.95, 139.03, 155.84. MS m/z 446 (M+). For C28H22N4O2 Calcd: C, 75.32; H, 4.97; N, 12.55. Found: C, 75.29; H, 4.95; N, 12.49. 8b: mp. 258–260°C; IR (KBr) νmax/cm-1 1605 (C = N); 1H NMR (DMSO-d 6 ) δ 2.51-2.61 (br, 2H), 4.48-4.49 (br, 4H), 7.03-7.06 (t, 2H, J = 9 Hz), 7.26-7.27 (d, 2H, J = 9 Hz), 7.39-7.42 (t, 2H, J = 9 Hz), 7.48-7.51 (m, 2H, J = 9 Hz), 7.85-7.87 (d, 2H, J = 9 Hz), 7.88-7.94 (m, 4H, J = 9 Hz), 8.70 (s, 2H), 9.02-9.03 (d, 2H, J = 9 Hz); 13C NMR (DMSO-d 6 ) δ 27.84, 66.00, 111.85, 113.00, 113.49, 114.85, 116.78, 120.79,127.71, 128.96, 131.44, 131.51, 133.10, 139.24, 155.84. MS m/z 460 (M+). For C29H24N4O2 Calcd: C, 75.63; H, 5.25; N, 12.17. Found: C, 75.66; H, 5.23; N, 12.18. 8c: mp. 267–268°C; IR (KBr) νmax/cm-1 1605 (C = N); 1H NMR (DMSO-d 6 ) δ 2.16-2.18 (br, 4H), 4.37-4.39 (br, 4H), 7.08-7.12 (t, 2H, J = 9 Hz), 7.20-7.22 (d, 2H, J = 9 Hz), 7.36-7.38 (t, 2H, J = 9 Hz), 7.47-7.48 (m, 2H, J = 9 Hz), 7.88-7.90 (d, 2H, J = 9 Hz), 7.90-7.92 (m, 4H, J = 9 Hz), 8.63 (s, 2H), 8.95-8.97 (d, 2H, J = 9 Hz); 13C NMR (DMSO-d 6 ) δ 25.38, 68.27, 111.89, 112.80, 113.43, 114.80, 116.81, 120.72, 127.73, 128.90, 131.38, 131.71, 133.09, 139.29, 155.78. MS m/z 474 (M+). For C30H26N4O2 Calcd: C, 75.93; H, 5.52; N, 11.81. Found: C, 75.91; H, 5.50; N, 11.83. 8d: mp. 293–294°C; IR (KBr) νmax/cm-1 1600 (C = N); 1H NMR (DMSO-d 6 ) δ 4.81 (s, 4H), 7.15-7.17(t, 2H, J = 9 Hz), 7.31-7.33(t, 2H, J = 9 Hz), 7.43-7.45 (d, 2H, J = 9 Hz), 7.50-7.52(t, 2H, J = 9 Hz), 7.71-7.73 (d, 2H, J = 9 Hz), 7.86-7.88 (m, 2H), 8.50-8.50 (m, 4H); 13C NMR (DMSO-d 6 ) δ 67.61, 111.83, 113.53, 114.02, 116.66, 121.39, 127.67, 128.13, 131.47, 132.68, 139.16, 145.36, 155.83. MS m/z 448 (M+). For C26H20N6O2 Calcd: C, 69.63; H, 4.49; N, 18.74. Found: C, 69.61; H, 4.51; N, 19.72. 8e: mp. 257–259°C; IR (KBr) νmax/cm-1 1608 (C = N); ); 1H NMR (DMSO-d 6 ) δ 2.61-2.64 (m, 2H), 4.48-4.50 (m, 4H), 7.03-7.06(t, 2H, J = 9 Hz), 7.26-7.27(d, 2H, J = 9 Hz), 7.38-7.42 (t, 2H, J = 9 Hz), 7.46-7.49 (t, 2H, J = 9 Hz), 7.89-7.95 (m, 4H), 8.71(s, 2H), 9.03-9.04 (d, 2H, J = 9 Hz); 13C NMR (DMSO-d 6 ) δ 27.83, 65.90, 111.96, 112.89, 113.39, 115.10, 116.49, 120.71, 127.68, 128.82, 131.24, 132.67, 139.37, 155.59. MS m/z 462 (M+). For C27H22N6O2 Calcd: C, 70.12; H, 4.79; N, 18.17. Found: C, 70.14; H, 4.76; N, 18.14. 9a: mp. 280–281°C; IR (KBr) νmax/cm-1 1605 (C = N); 1H NMR (DMSO-d 6 ) δ 2.26-2.28 (br, 2H), 4.25-4.29 (br, 4H), 7.19-7.21 (d, 4H, J = 9 Hz), 7.45-7.48 (t, 2H, J = 9 Hz), 7.87-7.95 (m, 6H, J = 9 Hz), 8.76 (s, 2H), 8.90-8.89 (d, 4H, J = 9 Hz); 13C NMR (DMSO-d 6 ) δ 28.42, 64.88, 109.83, 113.36, 115.27, 116.74, 119.23, 127.67, 128.64, 132.36, 136.02, 140.16, 160.17. MS m/z 460 (M+). For C29H24N4O2 Calcd: C, 75.63; H, 5.25; N, 12.17. Found: C, 75.61; H, 5.23; N, 12.15. 9b: mp. 235–236°C; IR (KBr) νmax/cm-1 1608 (C = N); 1H NMR (DMSO-d 6 ) δ 1.91-1.92 (br, 4H), 4.11-4.18 (br, 4H), 7.08-7.10 (d, 4H, J = 9 Hz), 7.59-7.60 (t, 2H, J = 9 Hz), 7.84-7.99 (m, 6H, J = 9 Hz), 8.35 (s, 2H), 8.55-8.56 (d, 4H, J = 9 Hz); 13C NMR (DMSO-d 6 ) δ 25.23, 66.59, 109.76, 114.03, 114.85, 117.15, 122.77, 126.81, 128.15, 130.94, 131.04, 148.07, 161.69. MS m/z 474 (M+). For C30H26N4O2 Calcd: C, 75.93; H, 5.52; N, 11.81. Found: C, 75.90; H, 5.50; N, 11.79. 9c: mp. 208–209°C; IR (KBr) νmax/cm-1 1608 (C = N); ); 1H NMR (DMSO-d 6 ) δ 2.26-2.28 (m, 2H), 4.19-4.22 (m, 4H), 6.86-6.89 (t, 2H, J = 9 Hz), 7.04-7.06(d, 2H, J = 9 Hz), 7.21-7.24 (t, 2H, J = 9 Hz), 7.54-7.56 (d, 2H, J = 9 Hz), 7.89-7.91 (d, 4H), 8.30 (s, 2H), 8.50-8.51 (d, 2H, J = 9 Hz). MS m/z (%) 462 (M+). For C27H22N6O2 Calcd: C, 70.12; H, 4.79; N, 18.17. Found: C, 70.14; H, 4.77; N, 18.16. 9d: mp. 273–275°C; IR (KBr) νmax/cm-1 1608 (C = N); ); 1H NMR (DMSO-d 6 ) δ 1.93-1.95 (m, 4H), 4.15-4.18 (m, 4H), 7.14-7.17(d, 4H, J = 9 Hz), 7.38-7.43(t, 2H, J = 9 Hz), 7.83-7.91 (m, 6H, J = 9 Hz), 8.67(s, 2H), 8.82-8.84 (d, 2H, J = 9 Hz); 13C NMR (DMSO-d 6 ) δ 25.26, 67.41, 109.65, 112.14, 114.50, 115.24, 116.31, 120.57, 128.46, 136.91, 140.62, 159.86. MS m/z (%) 476 (M+). For C28H24N6O2 Calcd: C, 70.57; H, 5.08; N, 17.64. Found: C, 70.54; H, 5.10; N, 17.66. 10: mp. ˃300°C; IR (KBr) νmax/cm-1 1609 (C = N); ); 1H NMR (DMSO-d 6 ) δ 5.25 (s, 6H), 7.14-7.17(d, 6H, J = 9 Hz), 7.14-7.17(m, 6H), 7.96 (m, 9H), 7.83-7.91 (d, 3H, J = 9 Hz), 8.63(s, 3H), 9.02 (d, 3H, J = 9 Hz). MS m/z (%) 744 (M+). For C48H36N6O3 Calcd: C, 77.40; H, 4.87; N, 11.28. Found: C, 77.38; H, 4.85; N, 11.25. A mixture of 2-aminopyridine (10 mmol), in dry benzene, dimethylformamide dimethylacetal (DMF-DMA) (30 mmol) was heated at refluxing temperature for 8h. The solvent was then removed in vacuo and the remaining oil was dried, then added to the appropriate bis(ω-bromoacetophenone) derivative (5 mmol), in absolute EtOH. The mixture was heated at refluxing temperature for 7h. The reaction mixture was then allowed to cool and the resulting solid was collected by filtration, washed thoroughly with ethanol and dried. Recrystallization from EtOH/DMF to afford the corresponding carbonyl analogue of the fused heterocyclic derivatives 14a,b and 15a,b. 14a: mp. 295–297°C; IR (KBr) νmax/cm-1 1710 (C = O); 1H NMR (DMSO-d 6 ) δ 4.81 (s, 4H), 7.14-7.17 (t, 2H, J = 9 Hz), 7.34-7.43 (t, 2H, J = 9 Hz), 7.43-7.45 (d, 2H, J = 9 Hz), 7.50-7.52 (t, 2H, J = 9 Hz), 7.72-7.74 (d, 2H, J = 9 Hz), 7.79-7.81 (t, 2H, J = 9 Hz), 7.86-7.87 (d, 4H, J = 9 Hz), 8.53 (s, 2H). MS m/z 502 (M+). For C30H22N4O4 Calcd: C, 71.70; H, 4.41; N, 11.15. Found: C, 71.72; H, 4.39; N, 11.13. 14b: mp. 263–265°C; IR (KBr) νmax/cm-1 1682 (C = O); ); 1H NMR (DMSO-d 6 ) δ 2.61-2.62 (m, 4H), 4.37-4.38 (m, 4H), 7.01-7.11(t, 2H, J = 9 Hz), 7.20-7.22(d, 2H, J = 9 Hz), 7.36-7.39 (t, 2H, J = 9 Hz), 7.46-7.48(m, 4H), 7.89-7.96 (m, 4H), 8.64(s, 2H), 8.98-8.99 (d, 2H, J = 9 Hz); 13C NMR (DMSO-d 6 ) δ 25.31, 68.20, 111.80, 112.04, 112.72, 113.35, 114.71, 116.73, 120.62, 127.67, 128.84, 131.29, 131.64, 133.02, 139.22, 144.06, 155.70, 185.70. MS m/z 530 (M+). For C32H26N4O4 Calcd: C, 72.44; H, 4.94; N, 10.56. Found: C, 72.42; H, 4.91; N, 10.55. 15a: mp. 213-214°C; IR (KBr) νmax/cm-1 1660 (C = O); 1H NMR (DMSO-d 6 ) δ 2.27 (m, 2H), 4.26 (m, 4H), 7.16-7.19 (d, 4H, J = 9 Hz), 7.47 (t, 2H, J = 9 Hz), 7.89-7.95 (t, 2H, J = 9 Hz), 8.76 (s, 2H), 8.89 (d, 2H, J = 9 Hz). MS m/z 516 (M+). For C31H24N4O4 Calcd: C, 72.08; H, 4.68; N, 10.85. Found: C, 72.09; H, 4.65; N, 10.83. 15b mp. 249–250°C; IR (KBr) νmax/cm-1 1658 (C = O); 1H NMR (DMSO-d 6 ) δ 1.95 (m, 2H), 4.18 (m, 4H), 7.12 (d, 4H, J = 9 Hz), 7.26 (t, 2H, J = 9 Hz), 7.66 (t, 2H, J = 9 Hz), 7.87 (t, 4H, J = 9 Hz), 8.25 (s, 2H), 8.57-8.60 (d, 2H, J = 9 Hz). MS m/z 530 (M+). For C32H26N4O4 Calcd: C, 72.44; H, 4.94; N, 10.56. Found: C, 72.42; H, 4.92; N, 10.52.